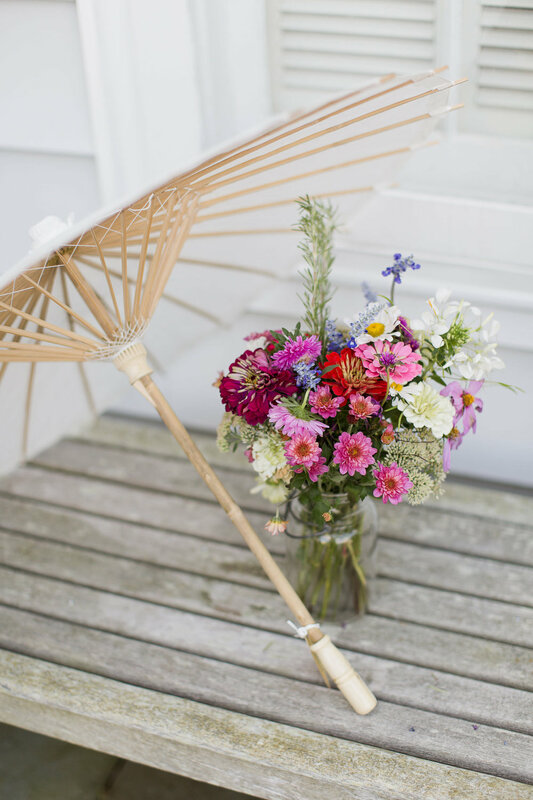 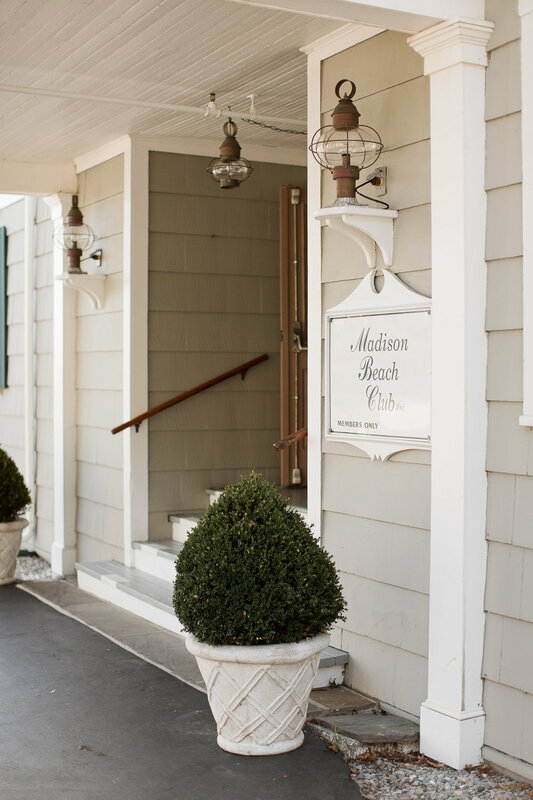 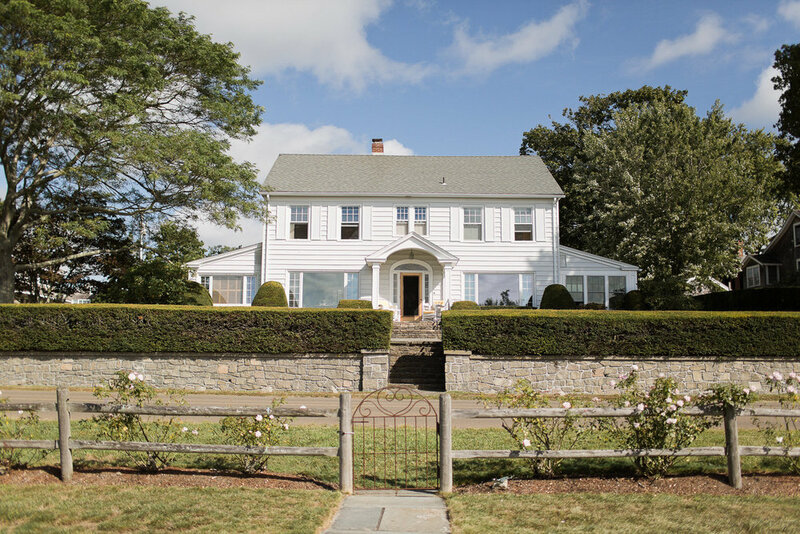 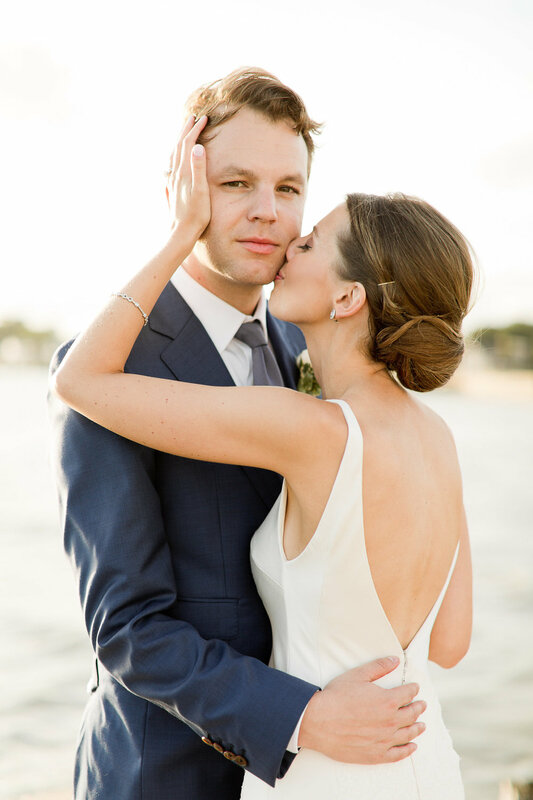 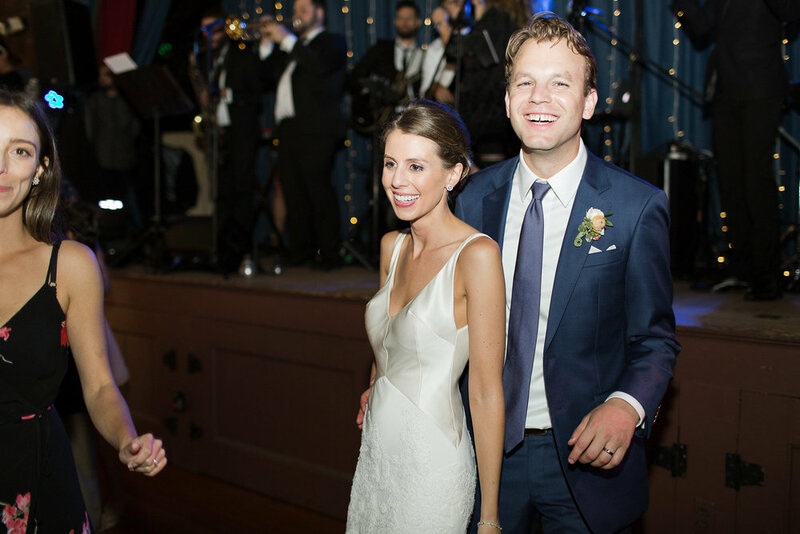 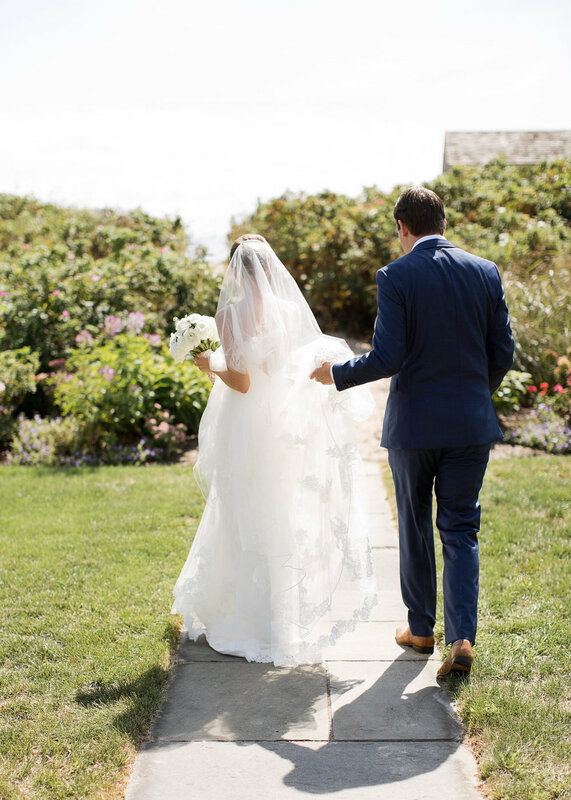 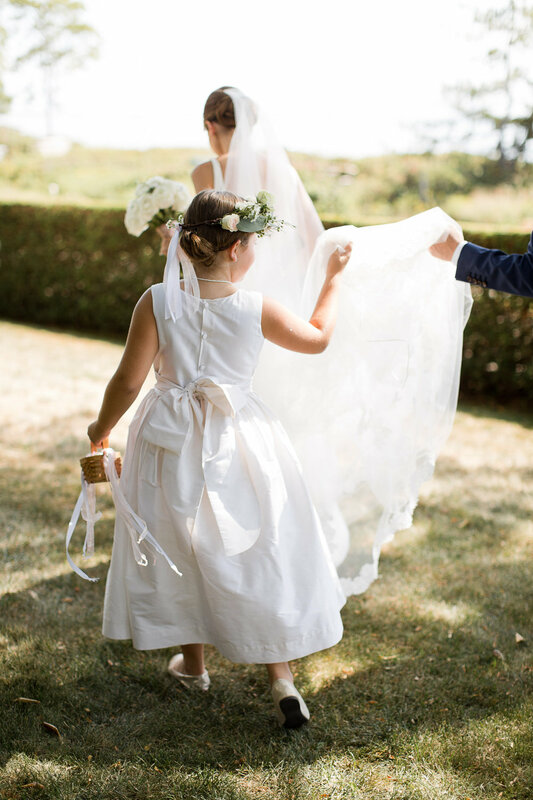 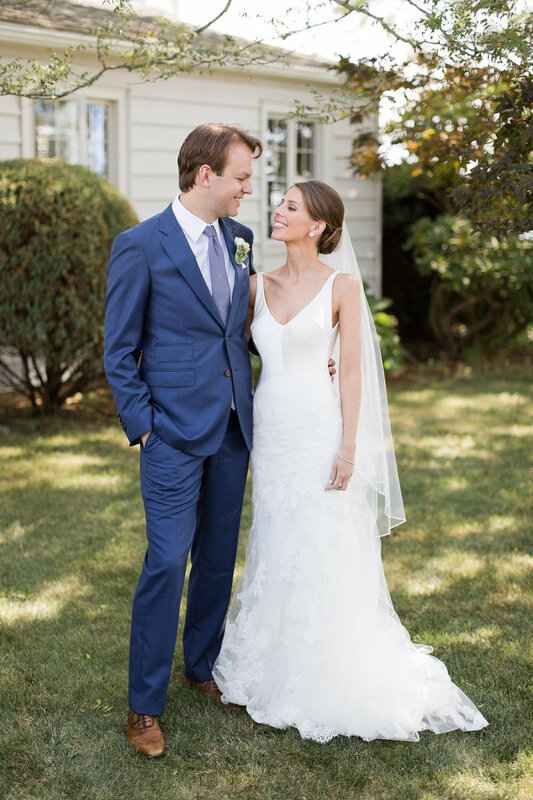 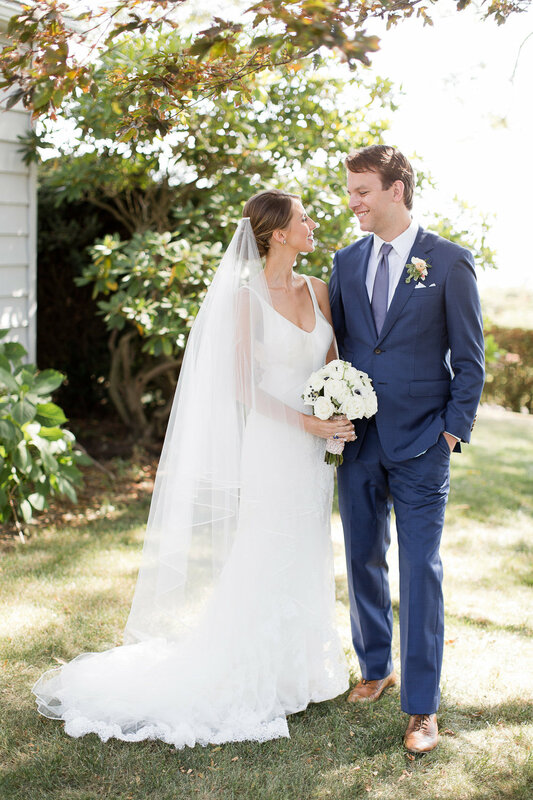 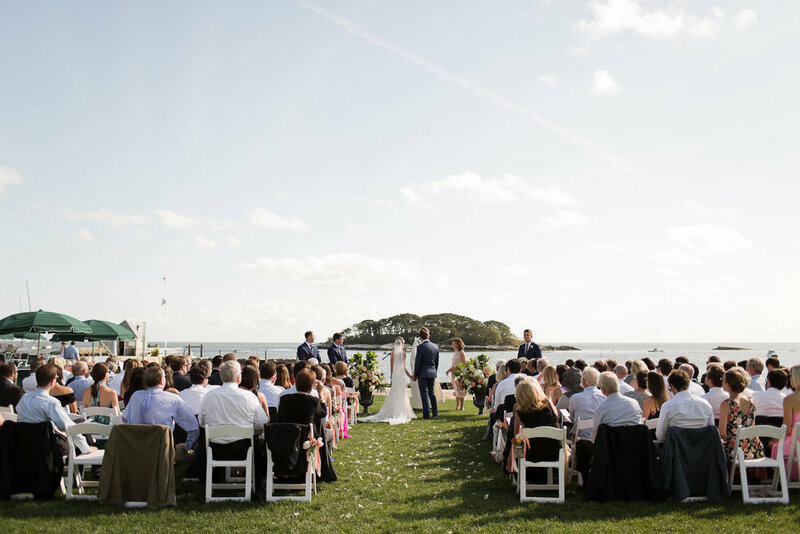 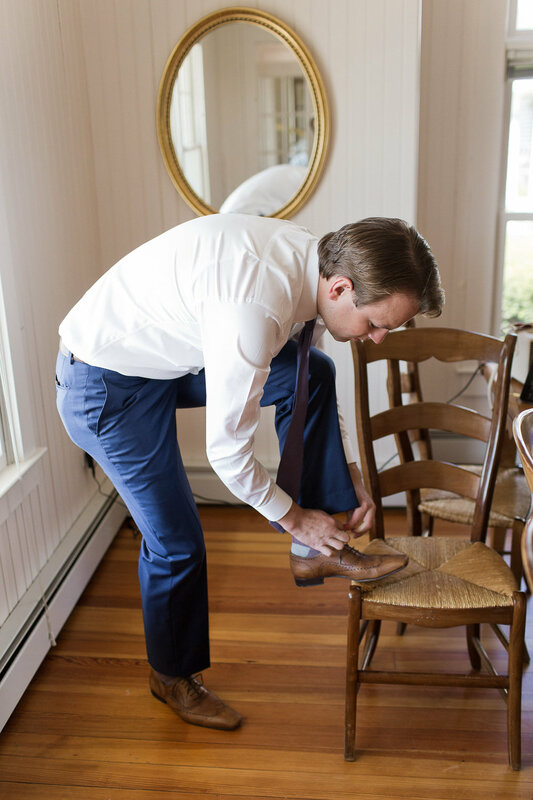 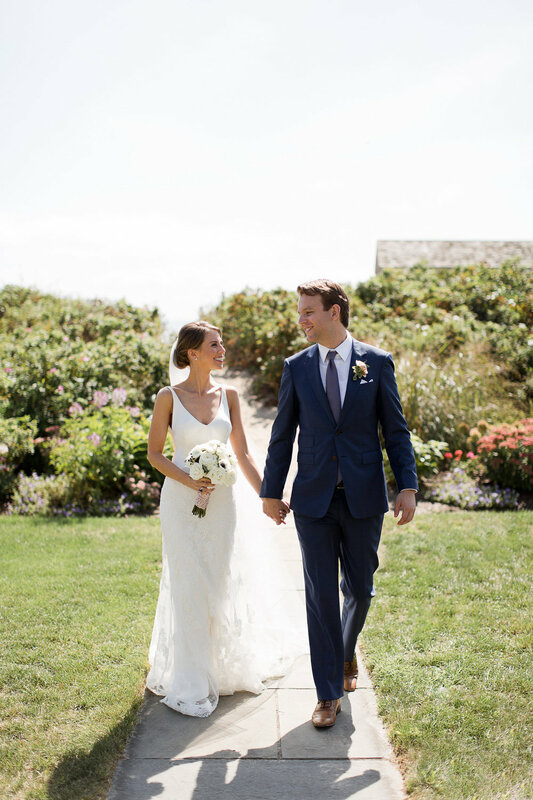 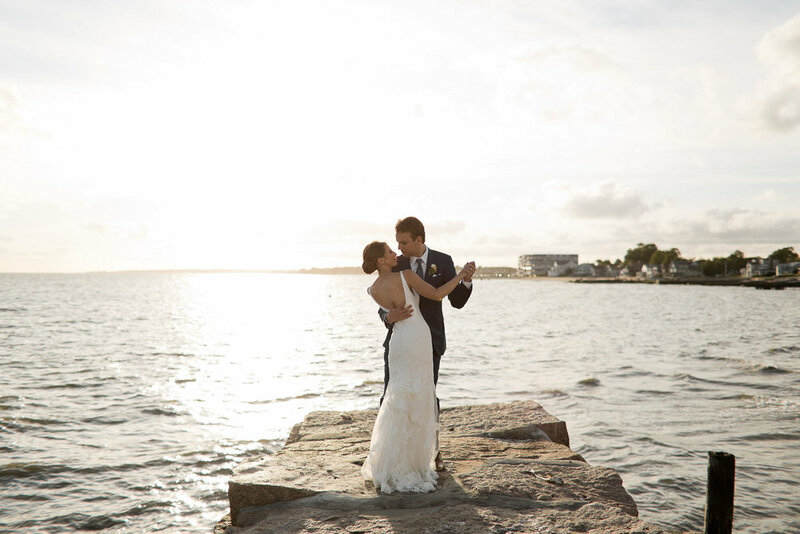 Saying "I do" just down the street from where the bride (Meghan) grew up, the couple set out to combine their affinity for family, travel, the shoreline, and vintage finds - adding a bit of New York edge (their now home together as newlyweds!) 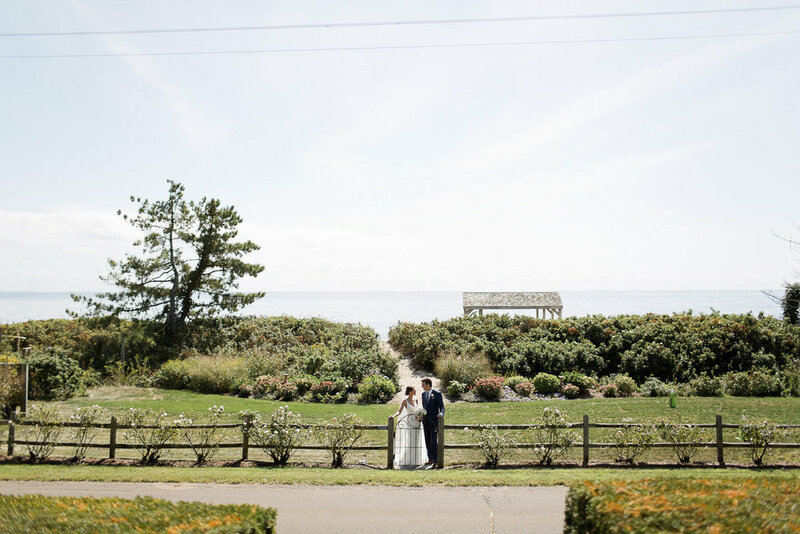 along the way. 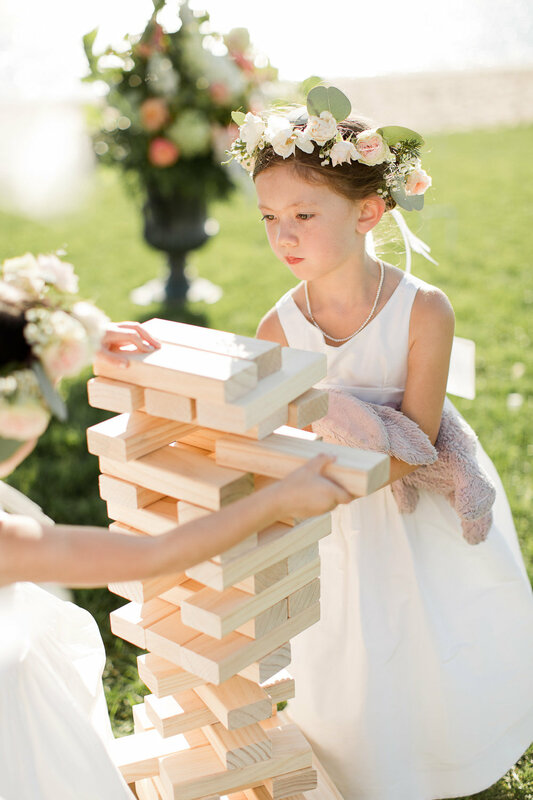 The day's pantone was inspired by pops of sunset colours mixed together with soft neutrals like blush, ivory and grey while their aesthetic tied together romance, timeless elegance, and whimsy with just a touch of industrial thrown in. 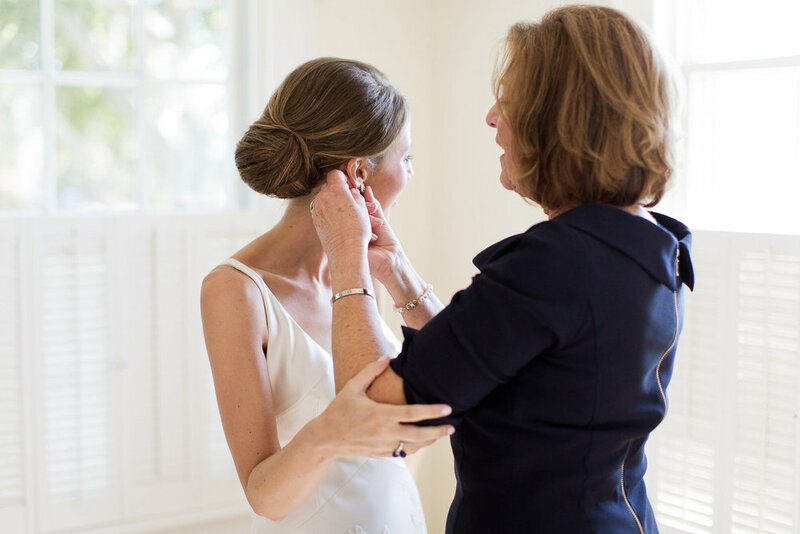 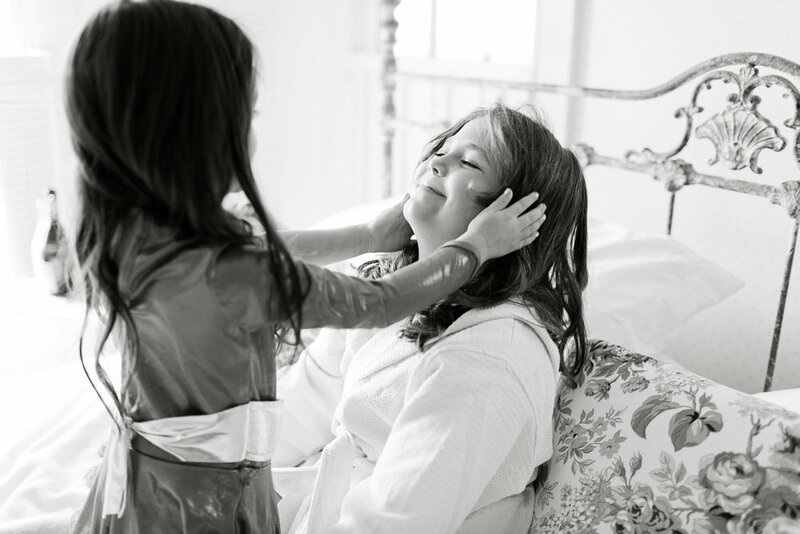 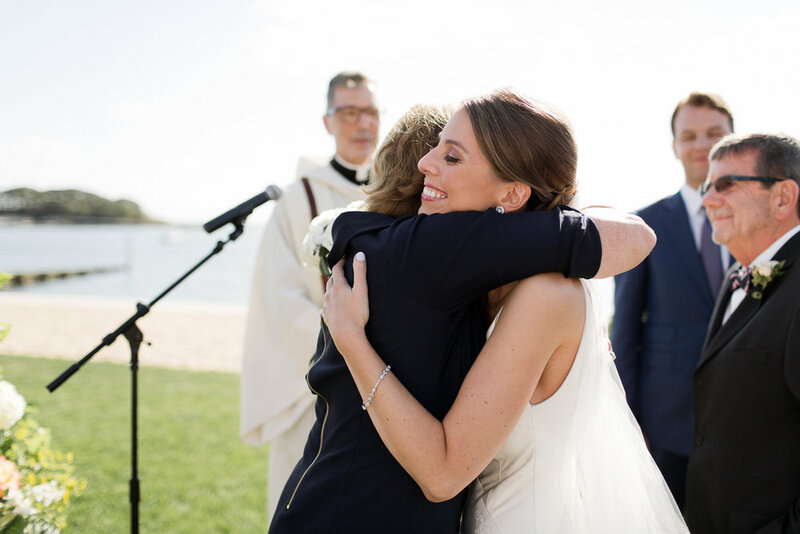 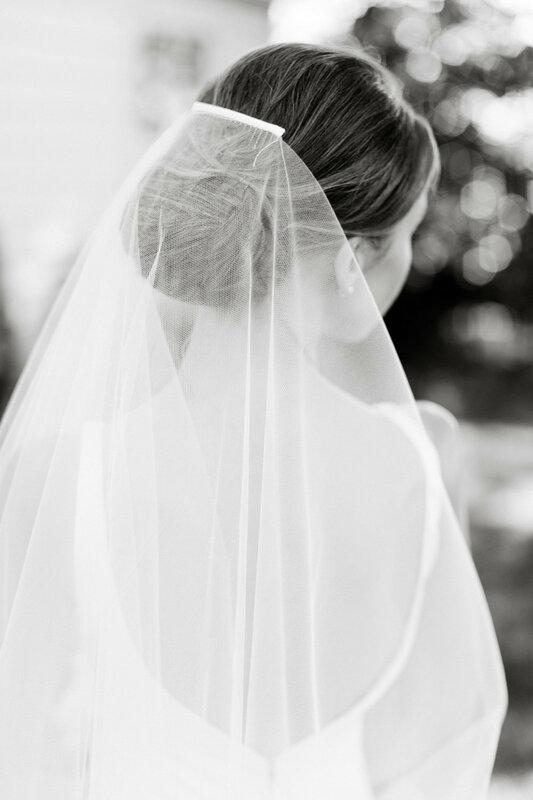 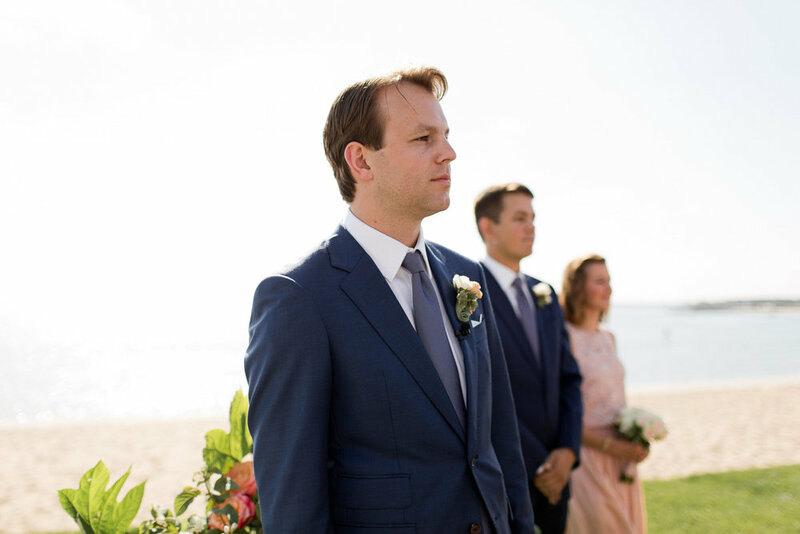 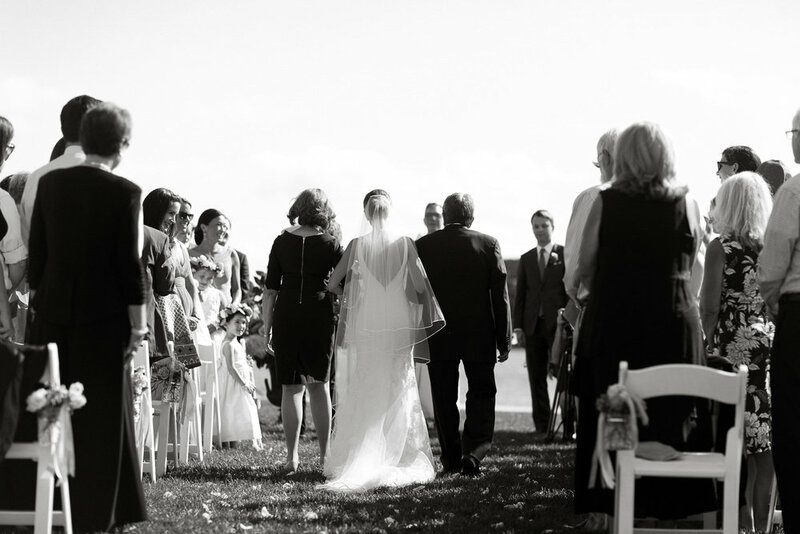 In keeping with the importance of highlighting family, Meghan prepared for the day at her family's beachfront home just a few blocks from where the ceremony & reception were hosted - the same spot her older brother was married years before. 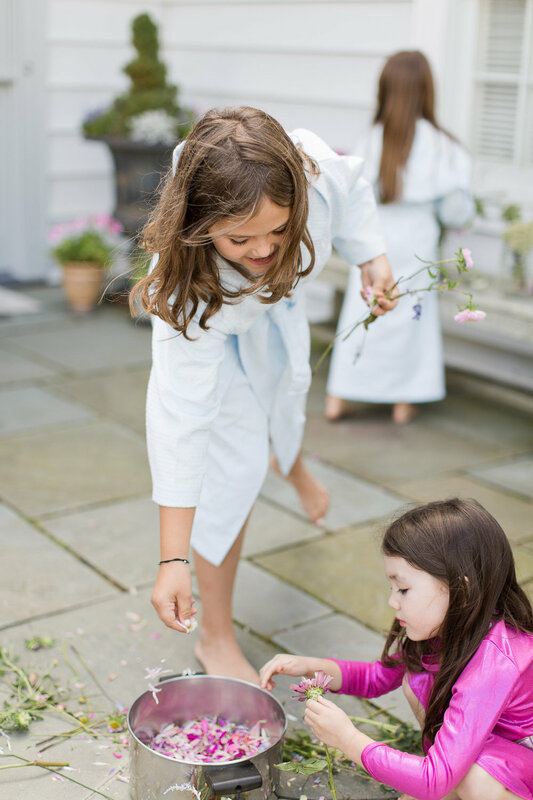 Upon arrival, I was greeted by the flower girls, Meghan's nieces, plucking fresh flower petals to later toss as they walked up the ceremony aisle. 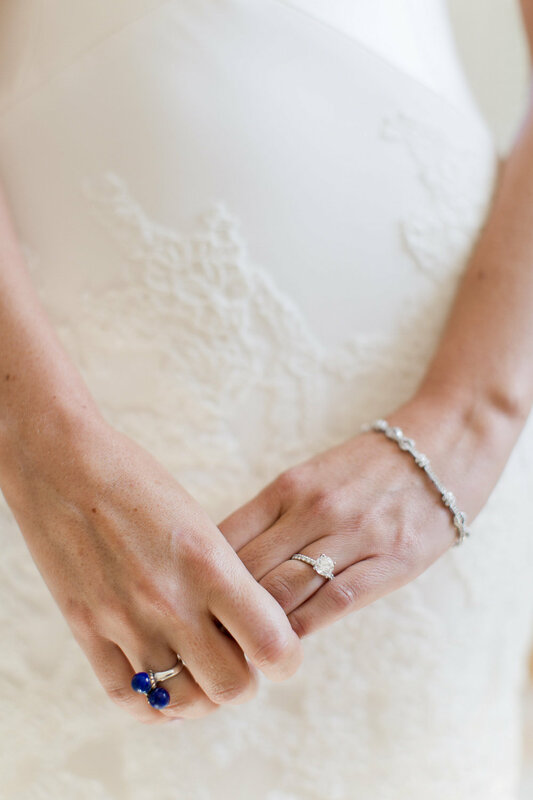 Dressing took place in Meghan's childhood bedroom, where she was donned with the groom's (Pete) grandmother's earrings and a Blue Lapis Tiffany & Co heirloom ring from her own grandmother. 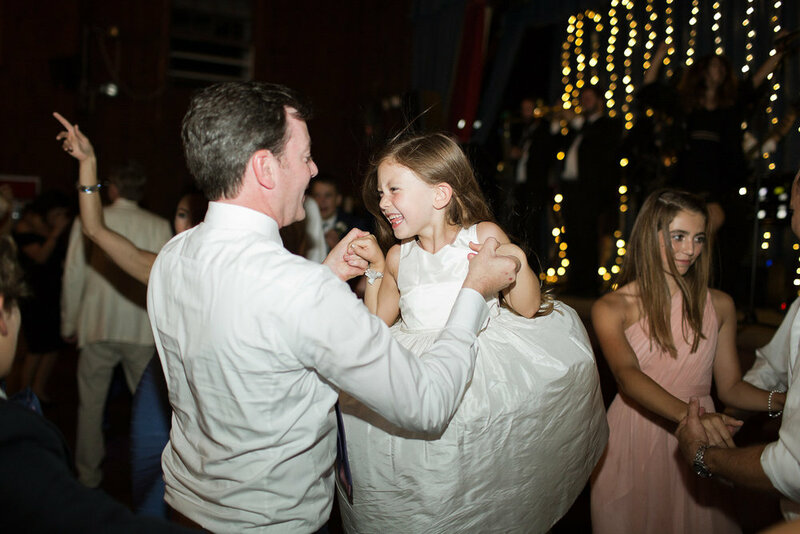 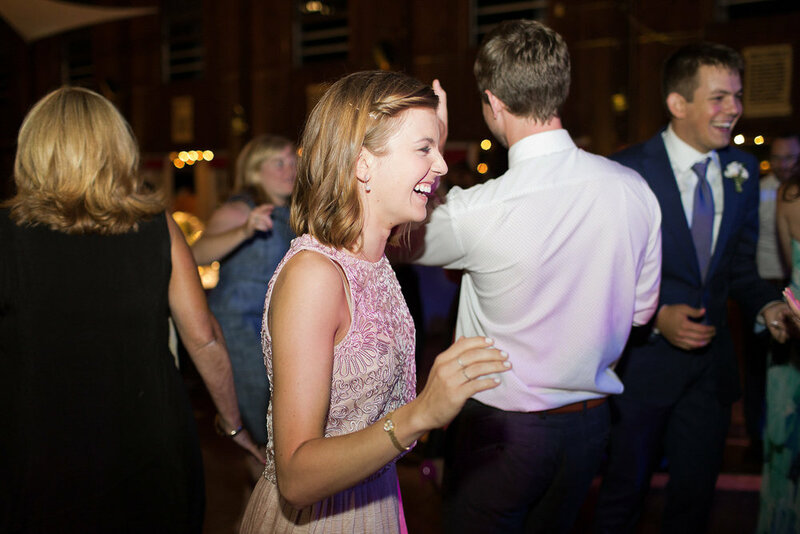 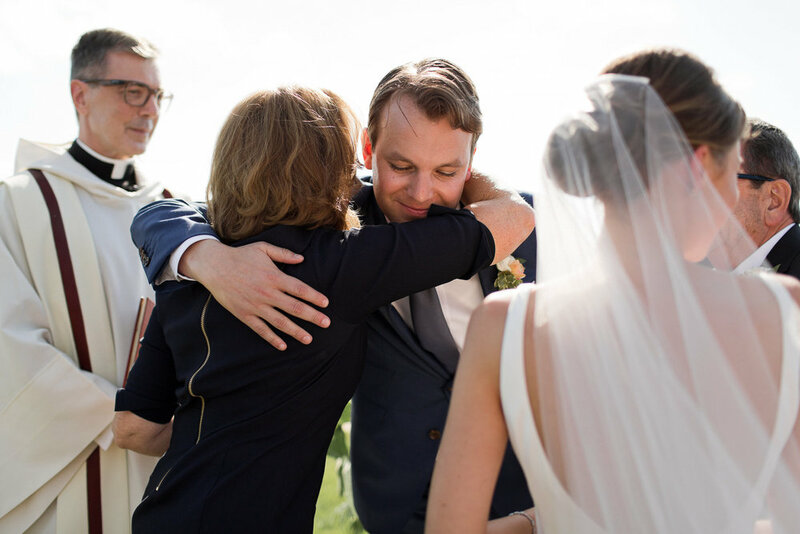 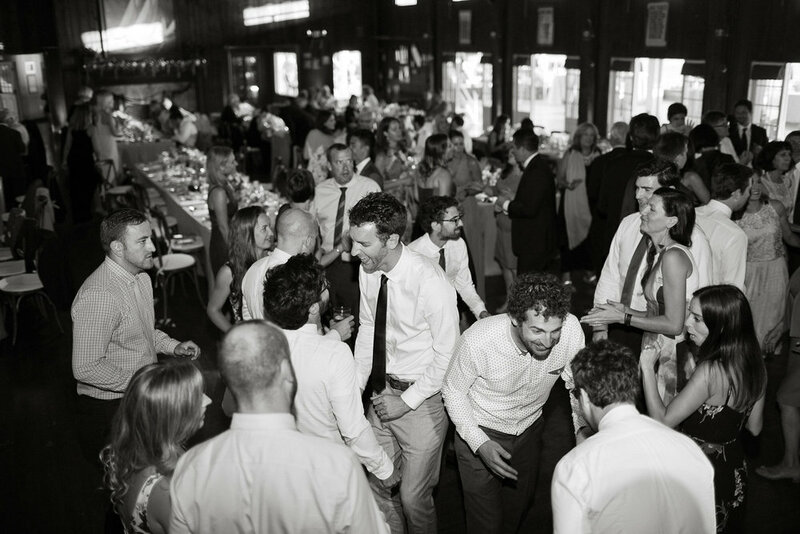 Opting to forgo a traditional wedding party, the couple was instead surrounded by family throughout the day. 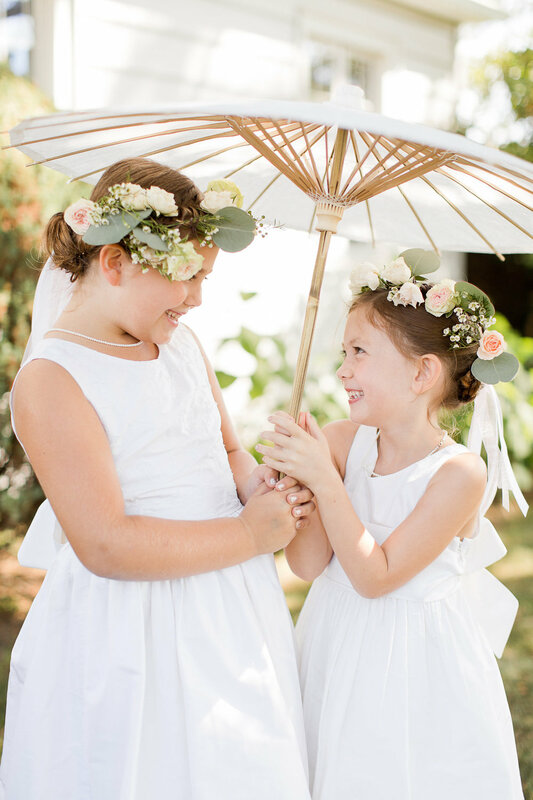 Paper parasols and cotton robes customized with each lady's initials were gifted to match Meghan's own while the bridal bouquet was wrapped with the same fabric used in her soon to be sister-in-law's dress. 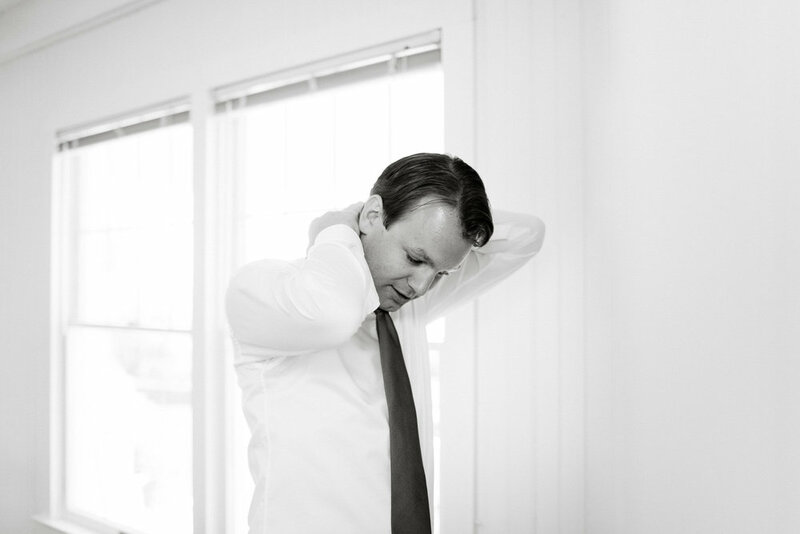 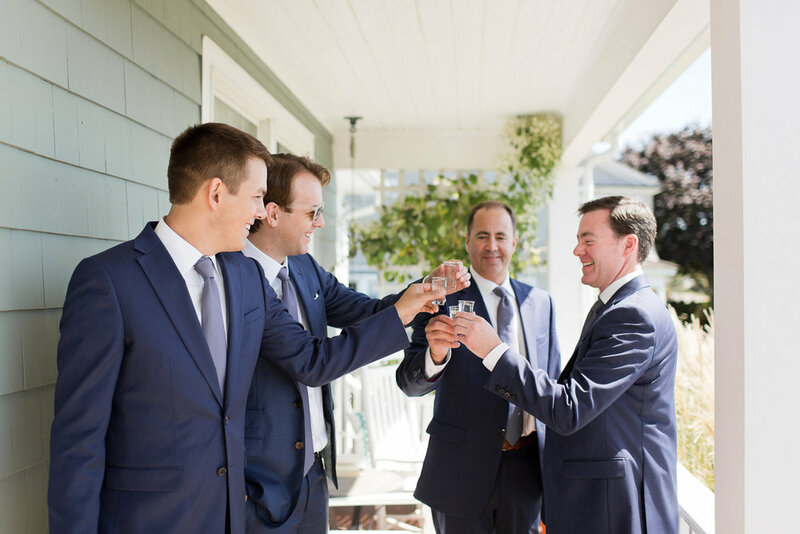 Meanwhile, the groom was preparing with the guys of the family just a few doors down the street. 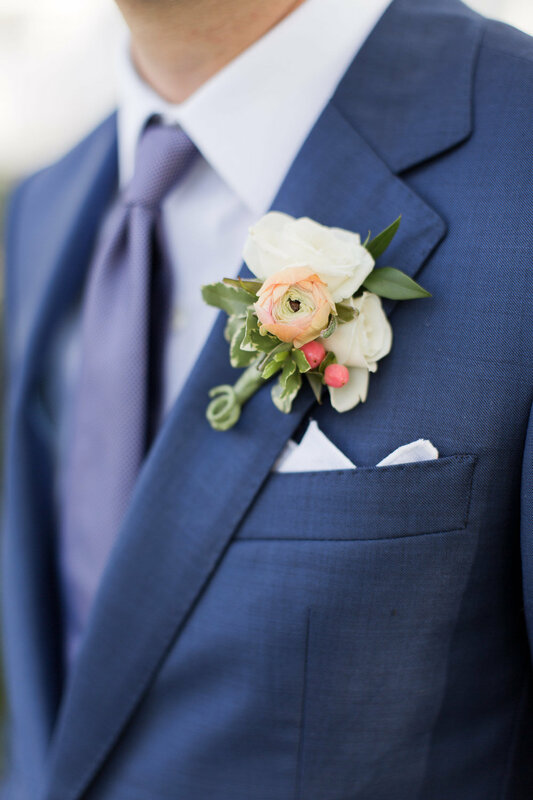 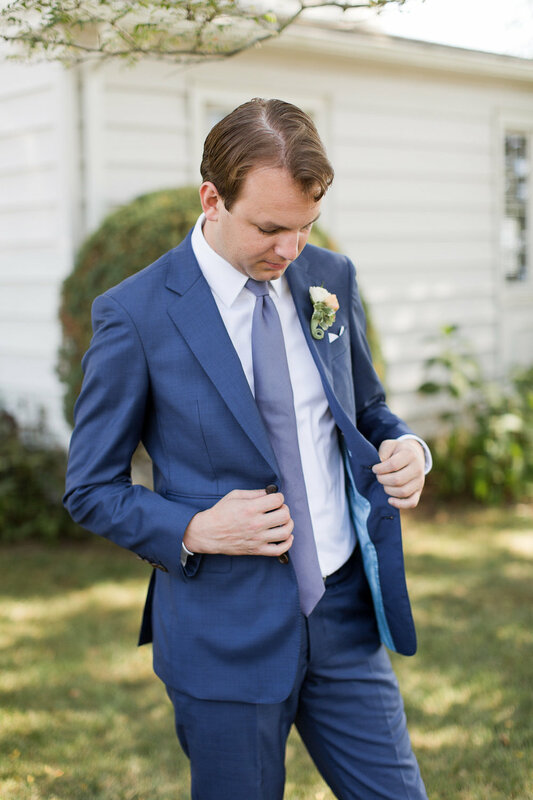 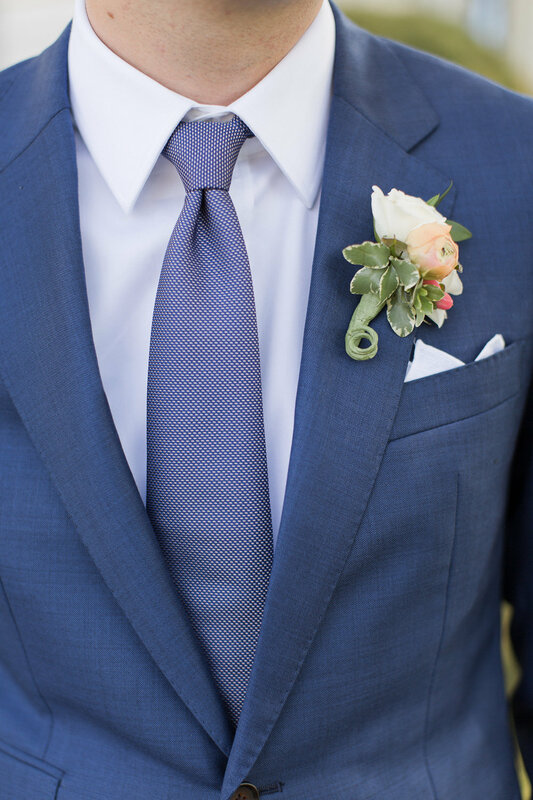 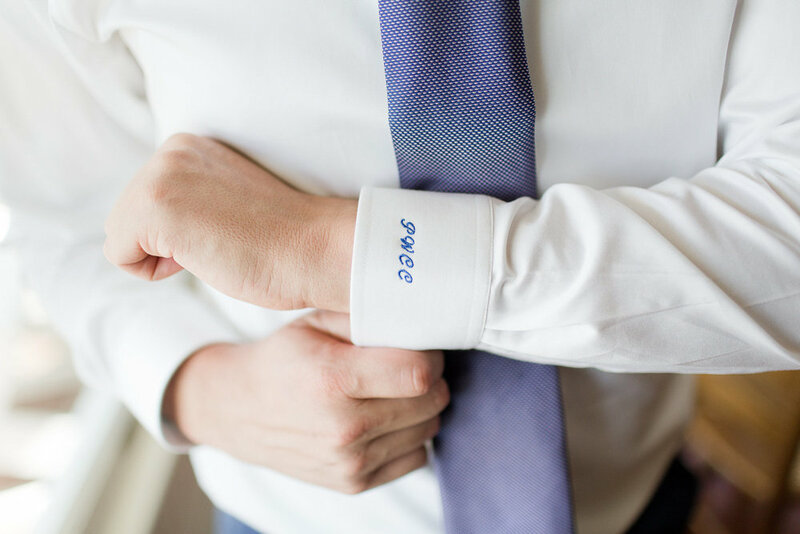 Custom details included embroidered initials on Pete's made-to-order shirt cuff & a bespoke pocket square embroidered with an "M & P" accompanied by the couple's wedding date. 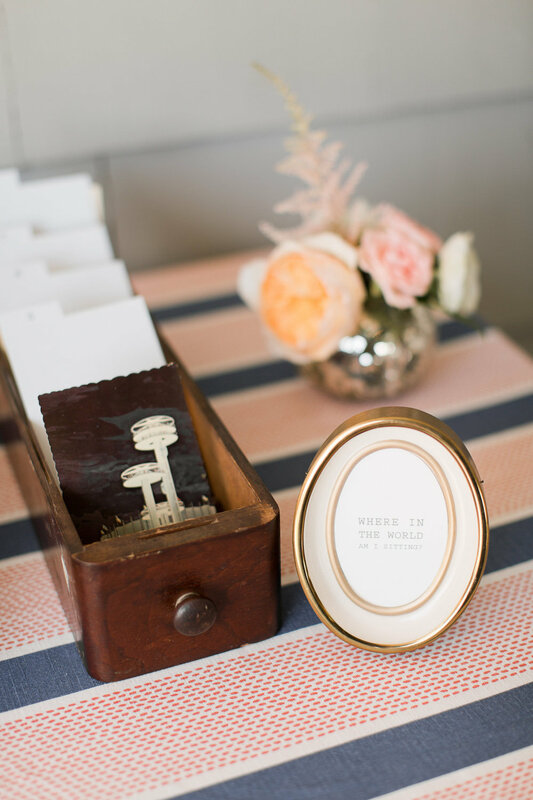 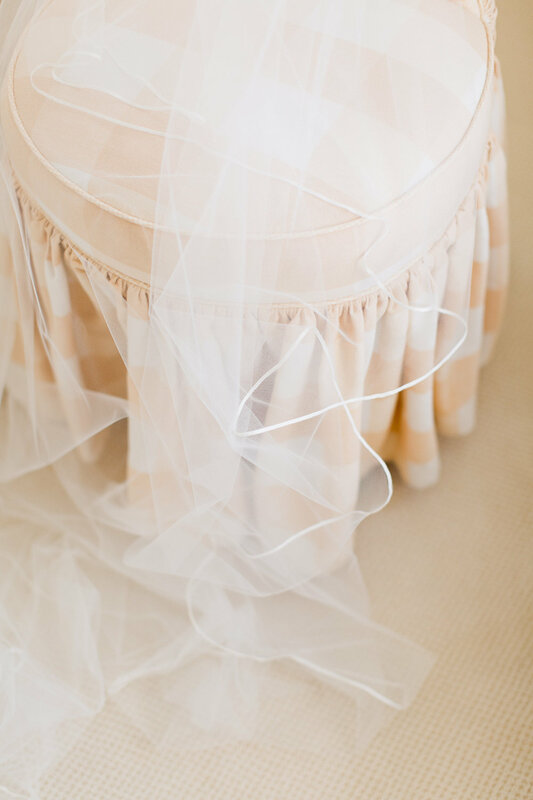 The invitation suite, like the rest of the day, was classic with a touch of vintage and personalization. 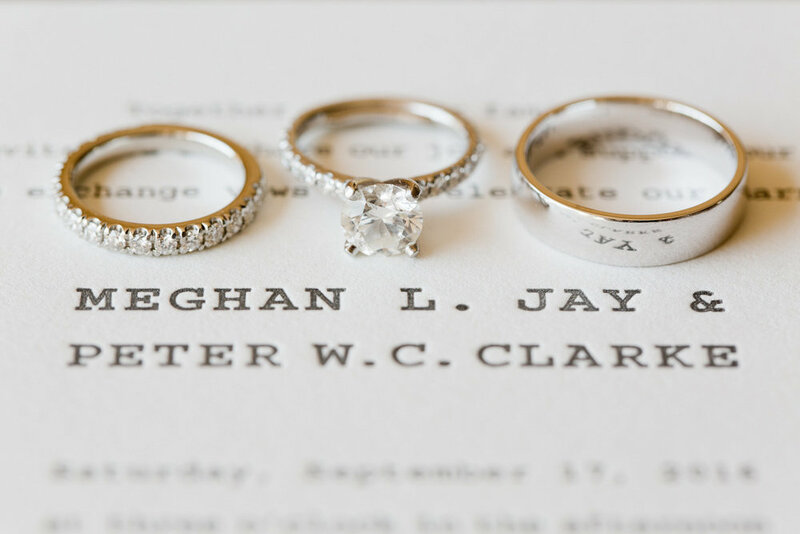 Letterpress printing with an antique typewriter font was complimented by a map of the Long Island Sound (their wedding's locale) as the envelope liner and an artist's rendering of their wedding venue on the suite's RSVP card. 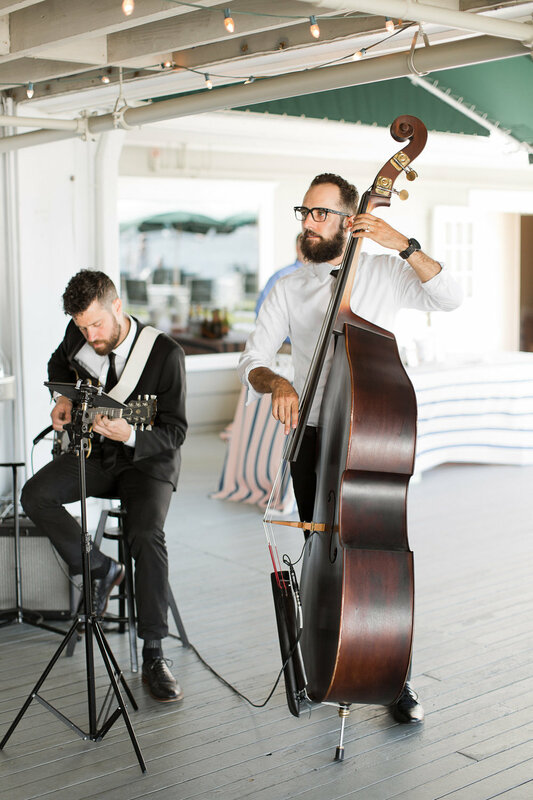 A waterfront Catholic ceremony officiated by Pastor Thomas Lipnicki, their family's long-time friend, was followed by an extended 2 hours of cocktails complete with a 4 piece jazz band and beach side lawn games. 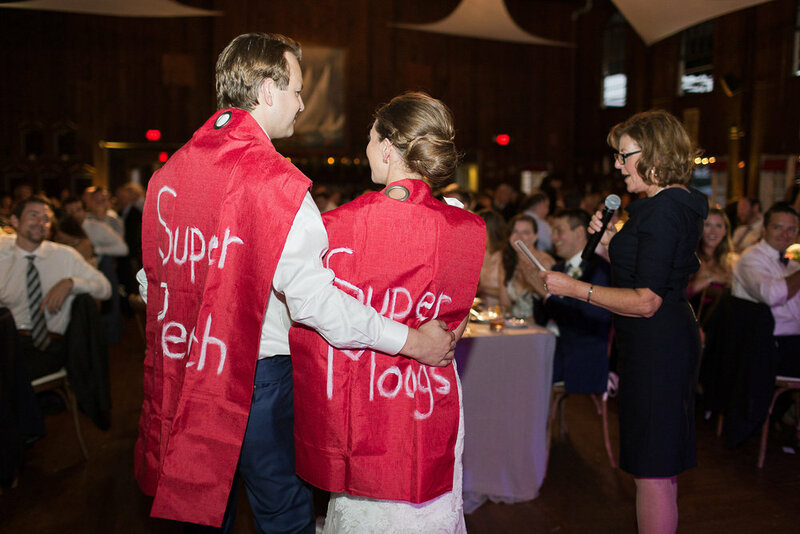 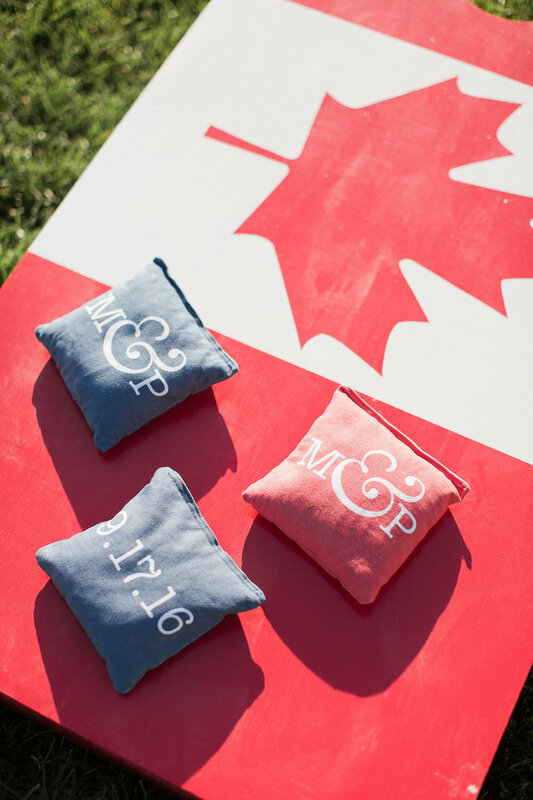 Traditional croquet was accompanied by over-sized Jenga and Connect Four, while corn hole boasted American & Canadian flags (representing the bride & groom's respective nationalities) and coordinating bean bags customized with Meghan + Pete's initials and their wedding date. 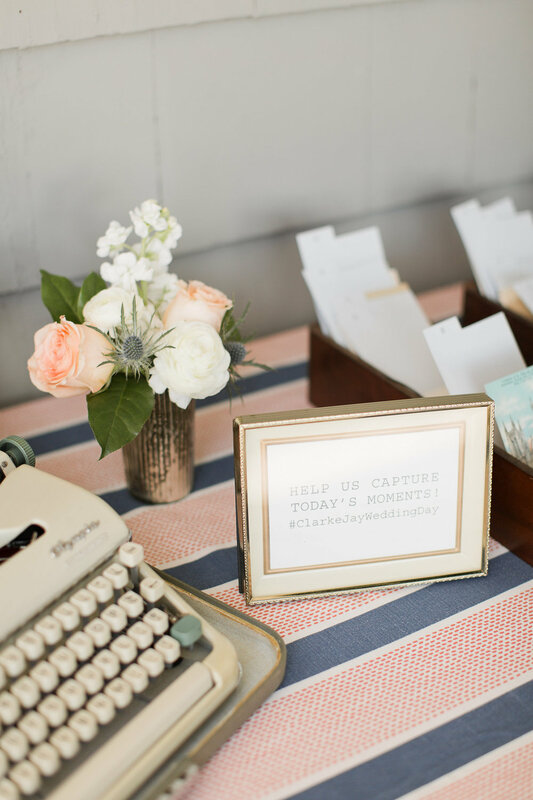 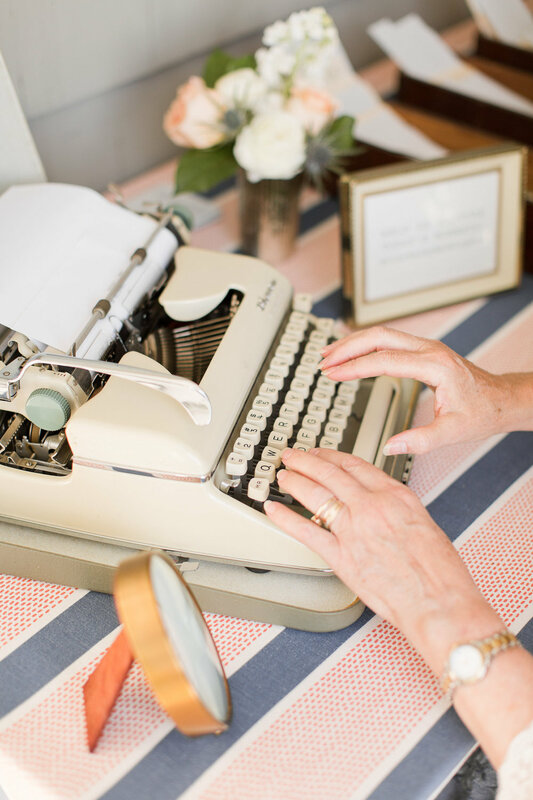 Creating their own spin on a guest book, a vintage typewriter was paired with a note requesting guests to type their advice & good wishes. 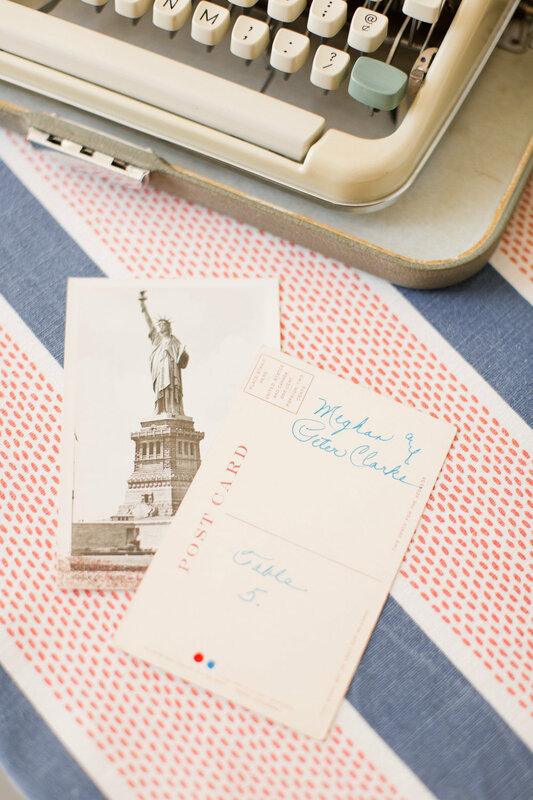 Handwritten vintage travel-themed postcards made for inspired seating cards while signs were created with typewriter text and a collection of mix & match picture frames. 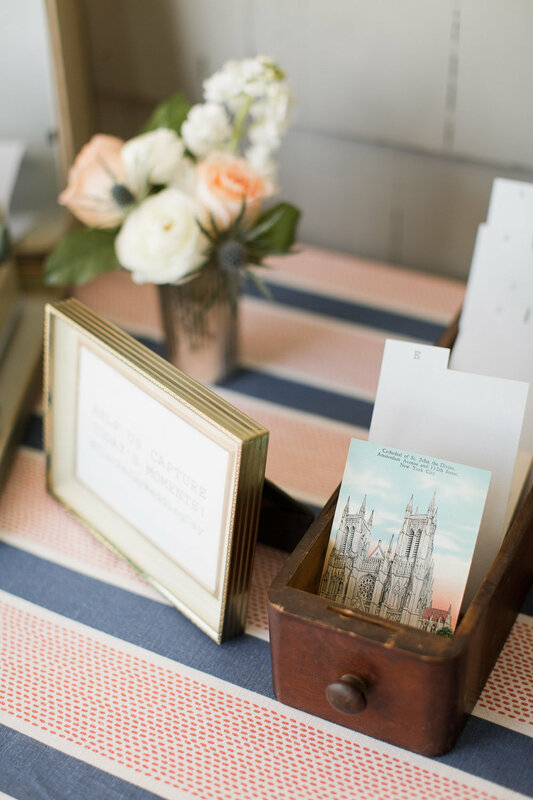 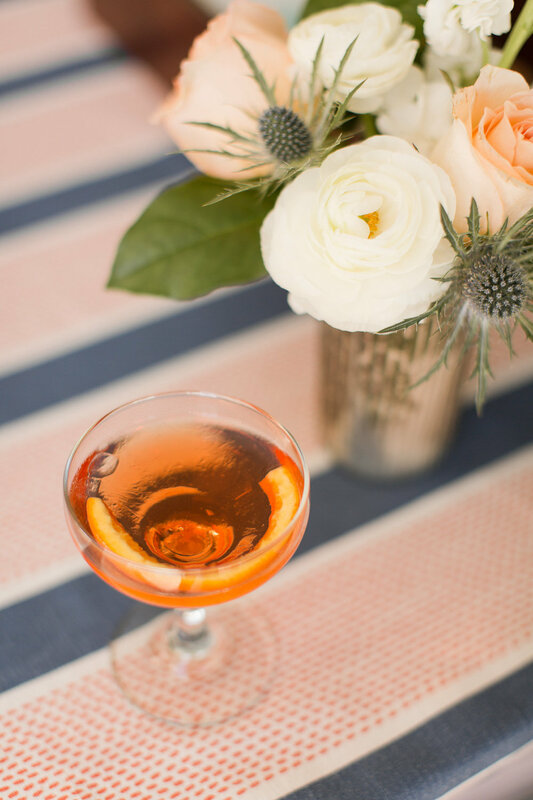 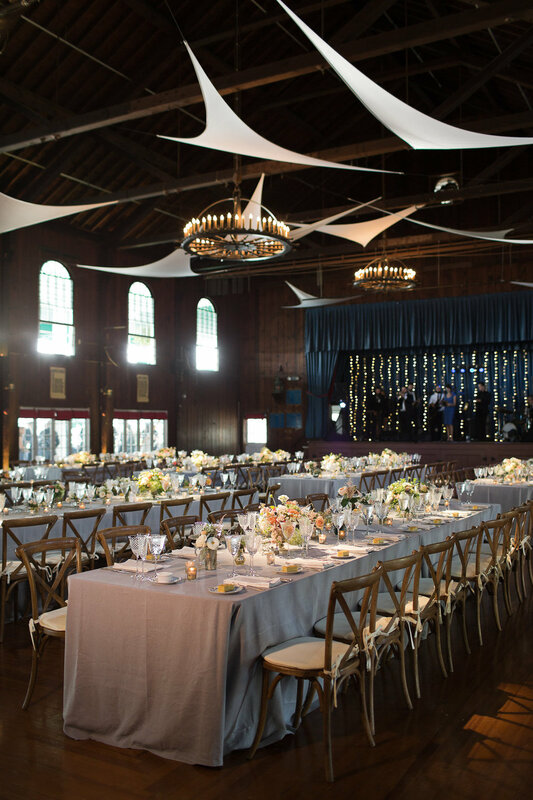 For the reception, personal touches were found in the mismatched antique silverware and guest favors by way of donations made in each guest's name to the Good Dog foundation (in honour of the newlywed's adorable pup, Ollie). 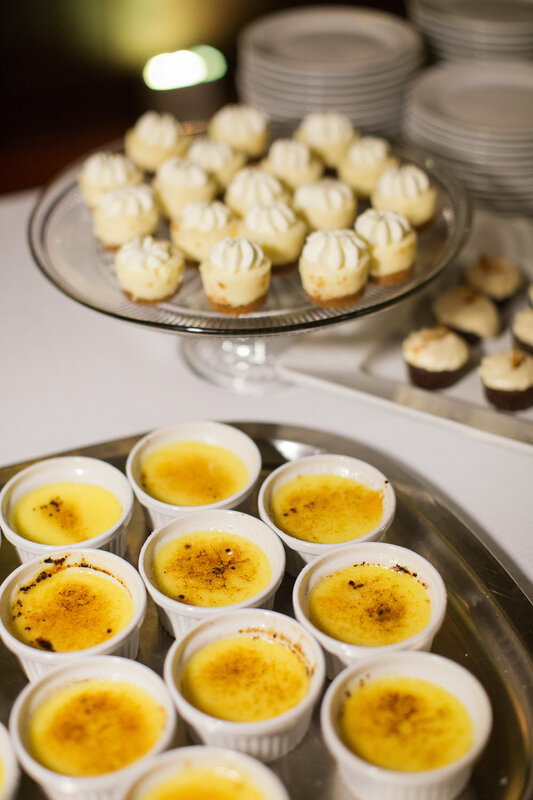 In lieu of a traditional cake cutting, French Fromage + Sauternes plates were passed (a nod to the couple's time spent together in Paris) in combination with a dessert table featuring a Canadian classic, "Nanaimo Bars". 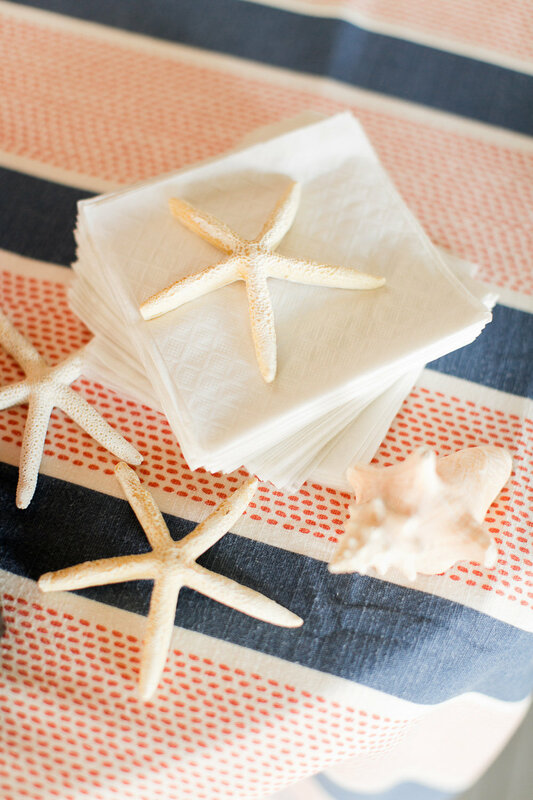 And to finish it all off, what better way to end a celebratory day at the beach than with a pile of Mexican Blankets to cozy up by an oceanside bond fire. 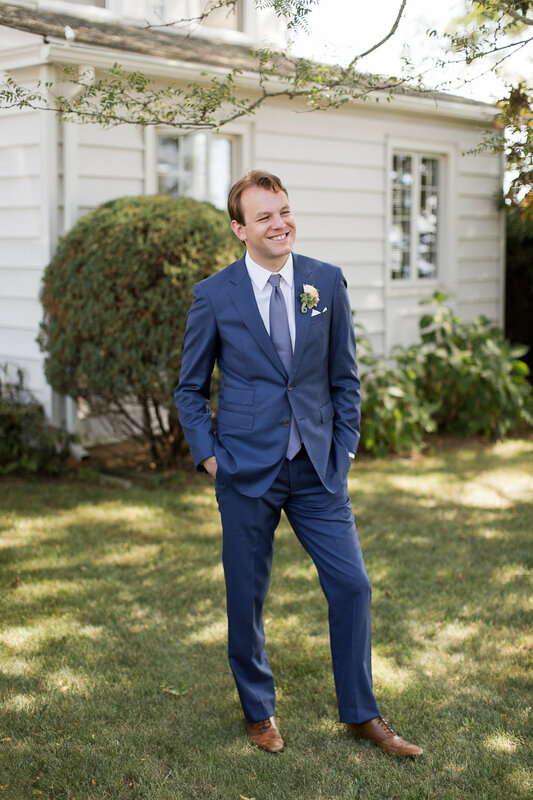 If you can't quite get enough of Meghan & Pete's love, be sure to check out their Fort Greene Brooklyn engagement photos.